Just bought this, and wanted to know how old it is and if you can still get parts for it and/or a manual. Runs good but needs new blades. Mine is a Sears King Seeley. It is also a 4-inch and does a very good and accurate job on smaller stuff. I have used it about 20 years. 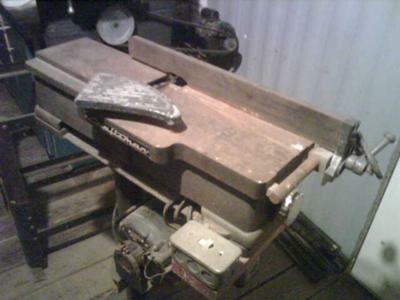 Also have a six-inch Craftsman jointer. Both are from the late 50s and early 60s. Also have a Craftsman 10-inch band saw that I have seen in a 1954 Sears catalog. All of them work great, but I' m about ready to sell out and quit the sawdust trade. Thanks for the tip I will google them and see what I can find. Freud makes blades to fit these old jointers. Did anybody ever get back to you? I have the same model jointer that I recently picked up from my dad. He bought it new from sears in 1967. It still runs great but I seen it could use a new set of blades. Sears no longer stocks them so I'm looking for a tool and die maker and will probably have some made.